You might think office storage isn’t much to get excited about. If so, allow us to change your mind. In an average office, people spend up to 30% of their time looking for information, so efficient solutions benefit everyone. 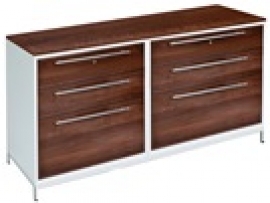 All office furniture desking ranges we supply have complimenting storage items. Each range offers a different variety of solutions. The choice is vast, and therefore far too many items to list, but by selecting the various ranges in this section, you will get an overview of some of the types available. If you cannot find what you are looking for please Contact Us.